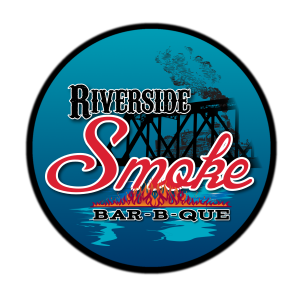 Riverside Smoke was born on the banks of the Savannah River just below the 5th Street train trestle bridge in Augusta, Georgia. Sitting around the fire pit as the sun was setting the conversation turned to competition barbeque. A decision was made to enter the 2012 Papa Joes Banjo Bque. That was when the debut of our signature BBQ taco topped with Slawsa was born. It was an instant hit and has been enjoyed by thousands since that day. The success of that one item and a first-place call in pork led to the purchase of a food trailer, many catering events, and now our first Restaurant. 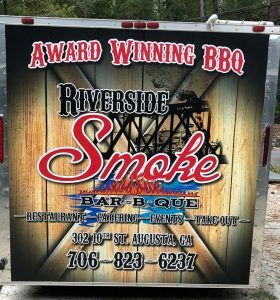 Riverside Smoke BBQ, Brisket, Bourbon, Beer is Augusta’s first Flex Casual restaurant. Two concepts; lunch is a traditional fast casual and dinner is a full service seated experience. It is the best of both worlds. We are trying to meet the needs of our guest by offering a very quick and delicious lunch followed by a slower paced dinner. While your food is being prepared, our guest will be able to relax with drink options from a full bar and tunes in the air played live on our custom built stage. Our goal is to create a relaxed casual environment where people of all ages can see their friends, eat great food, and listen to live music. We take tremendous pride in our food. Everything is prepared fresh onsite in our smokers daily.